Are you getting so involved in the busy activities of the holidays that you are skipping your normal exercise routine, if you have one? This is the worst time to skip! The stress that most of us put ourselves under can be relieved with exercise. So, if you have a routine or a gym membership, make it a priority. If you don’t, this is a great time to start! Take a short walk, whatever you can handle at your current fitness level. If it is cold where you live, then bundle up, the fresh air is great for you. You will feel so wonderful when you are finished and you will be taking the first step toward improved health. 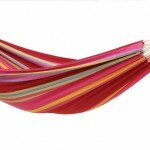 You can then reward yourself with a rest in a nice, comfortable cotton hammock, if you are so blessed!